When I think of Ping irons, the first things that come to mind are the Ping Eye 2 and Ping Zing -- both examples of the ground-breaking, investment cast, cavity-back designs Ping brought to the world of golf many years ago. While these clubs remain viable, and I'm sure are still played by thousands of golfers worldwide, Ping has not stood still in their club development. In an effort to reach even more and better players, Ping has developed a "player's iron" in the S58. Many better players prefer what is called a muscle-back iron (rather the perimeter-weighted, cavity-back design). This design allows the player to "work" the ball in either a controlled fade or draw far easier than with the perimeter-weight design. The S58 irons are a quasi-muscle back design that also incorporates some game improvement (i.e., forgiveness) characteristics such as: Custom-Tuning Port (CTP) that positions the Center of Gravity (CG) lower and deeper to give the club a slightly higher, yet still penetrating trajectory. Ping has also moved the CG within the set -- farther back on the long irons and farther forward on the short irons -- again to capture that same ball flight. The S58 also has a slightly wider sole to help the club move through the turf just a bit easier and be a little more forgiving. Finally, there is a Vertical Stabilizing Bar which is said to improve distance and shot dispersion, even on off-center hits. 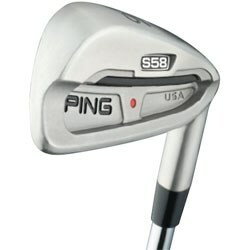 The Ping S58 irons look like a players club with a thin top line and compact head. The finish is a brushed chrome that, together with the overall design, create a clean, simple look that is generally preferred by better players. The Ping S58 is available in both Right and Left hand orientations; they are fitted with steel shafts in either Regular of Stiff flex. Irons are available from 2-iron through PW, but sets are generally 3-PW (8 clubs). Similar clubs in this same category are the Mizuno MP-32 and MP-60, as well as the TaylorMade MC Steel irons.